In Depth guide about Lee Sin written by experienced high elo Lee main. Covers everything from attitude and builds, through in-game strategies to subtle game mechanics - everything you need to know about Lee Sin. Lee Sin was one of my early pick-ups and he’s remained as my main and my go-to pick even to this day. Honestly I just simply love this champion’s kits and deep skill-cap, he’s one of the reasons I could keep having lots of fun while playing League even after so many games over the years. That’s exactly why I’m writing this guide – both to share my love and admiration for the champion and to teach you as much as possible using my knowledge, which comes from thousands of games as Lee on high-elo. Lee is one of the most versatile, fun and skill-capped champions in the game. No matter what the situation is you’ll usually have plenty of ways it can play out – some better than the others. There’s nearly endless depth to this champion’s skill-cap, for example – amateur Lee player would just simply Q+E+Q+auto attack+R his opponent while expert Lee would do auto attack+Q+auto attack+E+auto attack+R+auto attack+Q+auto attack to put out maximum possible DPS while also mind gaming you into thinking that you’ve got a chance to escape with Flash over the wall for which he’ll have few counter-measures prepared: ulting you sideways or behind, following with Resonating Strike, Ward Jump or his own Flash. This is exactly why you shouldn’t ever get discouraged by bad outcomes while learning Lee Sin. Focus only on your own mistakes, take every failure and loss as a chance to learn – even a game with troll or afk can be productive that way! Runes are fairly straight-forward. Attack Speed will be nearly always more DPS efficient than Attack Damage for Quints – think of Attack Speed as a multiplier of your AD in terms of DPS. AS Quints will outscale AD ones at about level 3-4 or even level 2 if you’ll start with red buff, which reapplies the flat damage with each hit. Your Glyph choice only comes down to deciding whether you’ll be taking any kind of magic damage in fights pre-level 9 – if you will then just go with flat MR, which will be most of the cases. Only thing worth noting about this ability is the fact that first hit after casting a spell will grant you 20 energy, while second 10. That’s why you should try to chain at least 1 auto between your spells in order not to run out of energy. Things worth noting here are that the first cast detects invisible units for 3 seconds and after hitting it you’ve got 3 seconds to recast it, that’s why you should be very patient with this spell – sometimes you’ll be able to follow up a Flash with your Resonating Strike instead of using a Ward Jump or your own Flash. Safeguard‘s cooldown gets greatly reduced if cast on yourself or your ally so always try not to cast it on minion/ward/other unit if not necessary. Also keep in mind that this ability can be cast on any ally unit – that doesn’t exclude things like Zyra’s Plants, Zac’s Passive Blobs, Jarvan’s Flag etc. Tempest also detects invisible champions, but in AoE and for 4 seconds. It also leaves you with 3 seconds to recast your E. Good use of this spell will be casting it instead of using one auto while chasing enemy down or patiently waiting with Cripple activation until the enemy starts running away. Every enemy champion struck by the kicked target will receive additional damage based on ulted target’s max health, which means that the enemy ADC hit with a tank can nearly get 100-0ed even with your off-tank build. Also target cannot cast anything mid-flight after getting kicked. You’ll always start out with Machete and Refillable Potion. Your first buy should always be Challenging Smite Upgrade before anything else and then Red Warrior Enchantment (you can buy tier 1 boots after Red Smite Upgrade and 2 Long Swords. If you’ll face lots of magic damage you can also rush Hexdrinker after Red Warrior and tier 1 boots. After completing Warrior you’ll either get Black Cleaver and then upgrade boots to tier 2 (either Merc’s or Ninja Tabis depending on the enemy team) or buy these 2 items the other way around, usually only when you’ll get behind / will face alot of physical auto attackers (Ninja Tabis) or Magic Damage / CC (Mercury Threads). Afterwards everything is up to the enemy team comp, but items like Sterak’s and Maw combo will be your usual go-to among with Randuim’s Omen – this trio of items will grant you survivability against nearly everything. Titanic Hydra/Frozen Mallet – These are good additional off-tank options if you are ahead. Ravenous Hydra/Last Whisper items – These are your options when you are 1-man carrying the game. Lee is the biggest counter to stealth due to detection with his Q and E. When you see these champions picked by the enemy team you shouldn’t even hesitate to pick him as a counter. Champions with little to no escape mechanisms will be very easy targets to camp by repeatedly ganking. Because Lee Sin has such a great synergy with the strongest MR items (mainly Hexdrinker, Maw and Spirit Visage) he will automatically do well against any type of Magic Damage based team comp, I’m talking here about at least 2 Magic Damage dealers (Elise jungle + Ahri mid for example). Alot of Lee Sin will come down to controlling objectives and counter-jungling and these champions will be especially abusable in that aspect which will only multiply your early game impact. There quite a few Lee in-game mechanics that you’ll have to learn in order to improve. Since there is no Sandbox mode in League, your best option will be going onto a custom game, rushing 45% CDR (you’ll have to spend points into middle mastery tree to get additional 5% CDR) and practicing everything there until you’ll be confident that you’ll be able to pull it off at least 9 out of 10 times. Having Trinket and Safeguard bound optimally (for me it’s W for Safeguard and T for Trinket, in my opinion, if these commands are in the same row of keys on your keyboard, it’s gonna be slightly easier to pull off than on default 4). Learning the exact range of Safeguard and Trinket. This is the biggest difference and the most important trait of the good Lee Sin player – you must have exact ranges of Trinket Ward and Safeguard literally burned into your mind in order to pull off this combo optimally (for beginners, remember that Trinket range is slightly lower than Safeguard’s). It seems pretty easy to pull off but it is not at all. Your ult’s mechanic makes your enemy unnable to cast anything from the casting of spell until he lands so if you’ll cast Sonic Wave onto him, you’ll hit it 10/10 times. The hard thing about that will be teaching your muscle memory to immediately stop all mouse movement while casting your R, if you’ll cast Sonic Wave afterwards then it will be always sure to hit that way. Attack Speed buff from your passive for next 2 auto attacks should always be abused while clearing the jungle. If your remaining 2 basic spells are still on 3+ second cooldown then you shouldn’t double tap your spell, but instead use the first cast, auto attack twice and only then use the second cast. This will both keep your energy up and make you rarely ever clear jungle without passive’s bonus Attack Speed. Resonating Strike has got built-in execute mechanic which increases it’s damage based on target’s missing health, which is applied to every target. That’s why while fighting enemy champions you should be patient and delay your Resonating Strike to the last moment to do maximum damage and also abuse Smite + Resonating Strike to secure objectives. Resonating Strike’s total damage to large monsters like Red and Dragon starts off at around 200 at early levels up to 600-900 at later levels, all depending on your build path. Lee Sin’s kit has a great sustain tool in his W. Every time you start a camp you should shield yourself with Safeguard and cast Iron Will after 2 auto attacks. Duration of Iron Will is your time to do as much DPS as possible to heal the most, example would be waiting 1 second for your W to be back on with Q already up to use it while Iron Will is on. Killing Scuttle Crab is a very good way to heal yourself up, exactly because of Iron Will. Sonic Wave, Tempest and Hydra actives all cancel out animations which makes expert Lee players able to further enhance their damage output in a fashion very similar to what Riven does. Very important and often overlooked use of that is auto attack+Tempest+Hydra active+auto attack combo – a quick 4-hit combination often useful for wave clear. Animation canceling also enables you to fit 1 auto attack + Tempest/Hydra active immediately after you kick your opponent with Dragon’s Rage. Classic Insec – Q+Q+Ward Jump behind the enemy+R – It’s quite basic and well-known, but still manages to catch people off-guard. Your Insec performance can only be hindered by how fluid your Ward Jump will be, that’s why you should focus on mastering this mechanic first before you start learning Insec. Classic Insec has a small counterplay window – your enemy can Flash behind your back after you Ward Jump and thanks to that he’ll get kicked in the opposite direction you’d like him to travel. Your countermeasure here is following his Flash with yours which will make for a huge outplay that’ll send enemy flying escapeless, that is without his Flash. Flash Insec – Q+Q+R+Flash behind the enemy – Important thing here is the fact that you have to start out the R animation and THEN Flash behind enemy’s back, because he won’t be able to cast anything while you’re casting your ult, making it a more dangerous version of Classic Insec technique. Flash Insec’s effective range can be extended by a Ward Jump or you can choose to save it for the escape – this will be your choice depending on the scenario you’ll be presented with. Ward Insec – Ward Jump in front of the enemy+R+Flash behind the enemy – This one is the least predictable, because usually your enemy is fixed onto your character and positions himself to dodge your Resonating Strike. This means that sometimes he might try to hide behind enemy champions/minions/monsters etc. which will be just in range for this combo and that’s your cue to use it. Engage Insec – This is certainly the hardest one to master. It’s an advanced version of Classic Insec. You are supposed to do the Ward Jump before the Resonating Strike even connects with it’s target – your objective here is simply getting behind your target’s back as soon as possible while still saving your Flash up as a potential countermeasure to the enemy Flash. This combo will be your late-game engaging tool that might be able to turn around even the most grim looking games, obviously your target here will be the enemy carry – you aren’t necessarily looking to do a multiknock-up with your ult, but to kick that carry into your team. This part of the game is still your major time to shine. With my off-tank build you still should be capable of soloing both enemy carries and sometimes even top laners up to about 30 minutes into the game, that’s why you should be constantly looking for opponent’s solo pushing on the side lanes or basically anyone out of position. Keep in mind that you are pretty much most mobile in the game and that’s why you can aggressively position yourself and often pull off moves too bold for other champions to perform – constantly test your limits and, with enough practice, you’ll learn exactly what you can and can not do. As the game goes on you’ll get outscaled by more and more champions and this is your que to slightly shift your gameplay. You’ll either try to knock-up multiple targets with your ult as a tool for engage/re-engage or try to launch the enemy carry with one of the Insec combos – the game outcome might hinge only on the way you’ll use your Dragon’s Rage. It’s common knowledge that you should watch your minimap, especially as a jungler, but there’s more depth to it. As you’ll keep practicing Lee, you’ll either be able to manually look at the nearby lanes with your camera while your spell rotation is on cooldown or as an expert you’ll be able to clear the camps without even looking at them – even if you’re not that advanced you’ve still got the first option at your disposal – that’s why you should abuse every occasion to watch how the lanes are playing out by yourself and see whether there’s a chance to successfully gank the opponent. While scouting for ganking opportunities it’s good to also imagine what would happen if the enemy jungler was there to counter-gank or theorycraft and assume his position on the map in order to take a well thought-out shot at a gank. While invading and counter-jungling you should have your eyes nearly glued onto the minimap, because your team mates aren’t always gonna inform you whether their laner began collapsing onto you – any sign of the enemy champion avatars on the minimap starting to move towards is already are a cue to quickly think of an escape path and withdraw from the enemy jungle. There’s a nearly endless depth to the possibilities and skill-cap of Lee Sin and that’s what should push you to strive and constantly learn – take on the hardest champion and squeeze out everything from both yourself and from what the game has to offer. I guarantee you satisfaction every time you thoroughly outplay your opponent. Lee Sin’s greatest enemy is himself and practice is his only weapon so keep working on your Lee Sin and I’ll see you on the Summoner’s Rift. 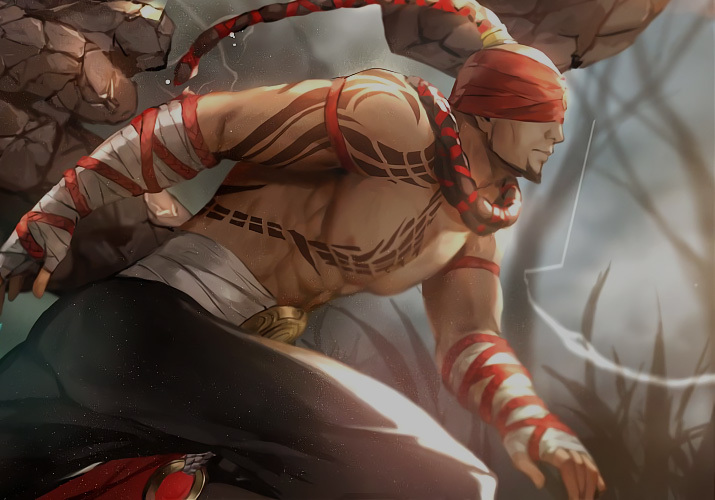 Oh, there are so sweet skins for Lee Sin, so I really want to learn him. But he looks SO HARD. I don’t know if I can learn him right, but I’ll do my best, and use this guide as a starting point! Thanks mate!